Our club hasn’t always had a “Delta” in its name. It was founded in 1931 as The Stockton Amateur Radio Club, and continued for the next 54 years as the area’s principal ham radio organization. That changed in 1985 with the merger of the smaller Delta Amateur Radio Club into ours, bringing about the new combined title. Who and what was the Delta Amateur Radio Club, and why did our area have two separate clubs for many years? The answer lies primarily in the FCC license structure that existed in the early 1950s. In those days every ham had to be a CW operator, and virtually every new candidate started out by taking a 5 word-per-minute sending and receiving test plus a basic theory exam. Success brought the Novice license, but it included a very strong motivator to upgrade as quickly as possible: it was only valid for one year and could not be renewed. For the Novice it was “up or out,” and upgrading to the next level meant a daunting challenge for many: a 13 word per-minute code test in addition to the General class theory exam. Copying 13 words in one minute was a deal killer for a lot of Novices. CW isn’t for everyone; some people simply have an inherent block that makes Morse code impossible beyond Novice speed, or sometimes at any speed. But the 1950s brought a new license class that gave Novices another option. The Technician license, initially created to foster UHF experimenting, was expanded to permit operation on 50 mHz and above. It was a permanent license that retained the 5 w.p.m. code requirement, and that was within the Novice’s grasp. As a direct result, many who couldn’t get over the 13 w.p.m. hurdle became permanent Technicians and began to operate exclusively on 6 meters and above. By the 1950s, the Stockton A.R.C. 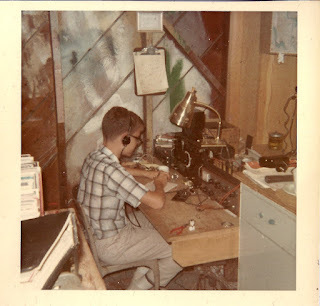 had long been established as a conventional ham club, with activities mainly focused on the usual HF bands. Very few were interested in VHF with its limited equipment resources and DX opportunities that ranged from rare to none. As a natural result, a small number of Technicians in the Stockton area began to associate among themselves and eventually stated to think about a VHF-centered club of their own. One of the early participants was Bill Shaw, W6BWK, who lived out in the delta on Bethel Island. Bill became a regular on the 6 meter net, which as much as anything else led to the choice of Delta Amateur Radio Club as the organization’s new name. That was around 1955—the exact date was never recorded since there was very little formality in the group at the time. In those early years, the Technician license largely achieved what the FCC had in mind in creating it: pushing hams to experiment on the higher frequencies. For the most part, the only ready-made VHF equipment was war surplus gear plus a limited number of commercial two-way radios, either of which always required some inventive modifications to work on ham frequencies. The only other choice was to build your stuff from scratch. Any of those meant that the Technician had to be something of an actual “technician” to get on the air. It was a rare Technician who didn’t gain a least a little skill at reading schematics, scrounging parts, installing components, soldering, and fixing something that wouldn’t work. The Delta club’s on-the-air activities were centered mostly on 50.4 mHz, simplex AM. Simplex was the natural choice since there were no repeaters back then, and AM radios were relatively easy to build. As for the frequency, VHF transmitters were all crystal-controlled and depended in large measure on the availability of war surplus crystals. 8.4 mHz “rocks” were commonly available, and were perfectly suited for a 6 meter transmitter’s oscillator—following that with a tripler and a doubler stage netted an output on 50.4. It became the equivalent of the 146.52 simplex frequency that we use today; even moreso with daily and weekly nets. DXing on 6 meters was another daunting challenge, as it is today, but some of the Delta club members had a clever method for catching rare band openings. Our area had no television stations on channel 2 in the 1950s, so a small TV set left on “2” with the sound turned down served as an effective DX monitor in the shack. When the otherwise blank screen started to mysteriously show a snowy picture, the TV was receiving some distant station on channel 2, which used 54-60 mHz. That meant that 6 meters was open to the samedistant area, enabling hams to catch a lot of new contacts that they otherwise would have missed. Snagging a new state that way became a lot more fun than casually doing the same thing on any given day using 20 or 40 meters. The club engaged in other fun activities on 6 meters, including transmitter hunts (interesting with tube-type radios on AM) and a somewhat silly “Royal Order of the Hootowls” certificate that one could earn by ragchewing for an hour, midnight to 1:00 am, with a certified member of the “order.” It was amazing how many actually did it and got their certificate. In the late 1950s, the Delta A.R.C. included a small number of genuine VHF experts. Chief among them was Rod Rigg, W6YGZ, long known for his high level of technical and engineering expertise in both amateur and commercial radio, and Clarence Hermance, W6RRN, who had remarkable skill at designing a building first-rate 6 meter transmitters and receivers. The picture here shows an Army Signal Corps TU-series tuning unit, widely available after the war. Clarence used them as the foundation for his homebrew 6 meter radios. Other club members built their own from his design. With the likes of Clarence and Rod guiding the path to success above 50 mHz, the Delta club began to attract new members, young and old, who contributed to the expansion of the club beyond its VHF experimenting roots. They participated together in Field Day and the other operating contests, using W6RRN’s call sign at first, and eventually acquiring W6BWK as the Delta club license when Bill Shaw became a Silent Key. Enter the era of the repeater. With the advent of VHF repeaters, hams whose prior focus was exclusively HF began to see a lot of value in the world above 50 mHz. Manufacturers were also on board, bringing out a steady parade of equipment for the 6 and 2-meter operator. By the mid 1970s, the Delta club started to look a lot like all those other ham clubs, which in fact were taking on characteristics that previously made the Delta club unique. FCC action contributed to the blend. The Novice ticket became renewable in 1978 and multiple revisions to the Technician license broke down the VHF-only barrier, granting limited operating privileges on the HF bands. That development, added to the repeater-fueled interest in VHF among all hams, left new licensees with no particular motivation to join the Delta club over the larger Stockton club with its wider following. The inevitable result was that the Delta club’s membership began a slow decline. The two clubs’ differing interests had meant that there was never any competition between them, but ham radio’s evolution gradually eroded those distinctions. By the 1980s, both clubs had members of all license classes, operated their own repeaters, and participated more or less the same in HF and VHF operations. There were even a few local hams with membership on both rosters, leading to a suggestion that the necessity for two separate clubs in Stockton had become largely obsolete. The decision to merge was made in 1984, and we became The Stockton-Delta Amateur Radio Club, Inc. in February 1985, with Charlie Johnson, WB6NVB as the combined club’s first president. The Delta Amateur Radio Club as a separate entity thus ceased to exist. The W6BWK repeater continued to operate into the new century, thanks to the dedication of WB6SUP, Gene Mills, who may have been the final Delta club member. Gene went SK in 2016, and with him went the last physical remnant of the old club. An Internet search will find a current Delta A.R.C. in Concord, CA, but there’s no connection with our former club or its members. The Delta Amateur Radio Club served the hams in our area very well during its 30-year run. Founded under circumstances that required innovation and perseverance, the club attracted members who were committed to meeting those challenges. By adopting that legacy in 1985, the Stockton club enriched its own heritage, creating the expanded and very active service club that we know today.